The Greece & Mediterranean Travel Centre has a range of options throughout the Middle East to suit any traveller and will help you every step of the way to ensure you experience the holiday of a lifetime. Sun-kissed Dubai is the sports capital of the Middle East, with world-class golf, tennis, horse racing, rally car racing, power boating, rugby, and sailing. It is also home to tantalising gourmet food and exceptional hotels. You have to go shopping in Dubai, with everything from designer fashion to hand tailored pieces and local crafts available. Abu Dhabi, the capital of the United Arab Emirates, defies the imagination. It is a city often referred to as the Arabian Jewel, the largest of the seven emirates and the second most populous city of the UAE. 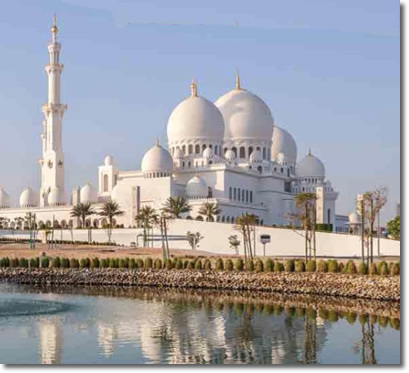 It is also fast-becoming the cultural centre of the region and is an impressive area to visit with the likes of Yas Island and the Corinche promenade, near the Emirates Palace. Discover the stunning country of Oman and visit the mountain ranges, wadis, desert and sea. Take a day trip to Nizwa or Salalah or a longer itinerary exploring the whole country. Oman is a great country to visit and you should see as much as your time and budget will allow. People who ordered Dubai, Abu Dhabi, Oman & Qatar also ordered the free travel brochures below. Click on the images to find out more about these brochures.